Miguel Cabrera - 1B DET Fanduel: 3900 Draftkings: 3600 - Cabrera will be battling Henry Owens at Comerica Park (Detroit, Michigan). Owens has an ERA against righties of 5.59 with a wOBA of 0.434. He really isn't doing well on the road. His ERA on the road is 7.11 and his wOBA is 0.458. Cabrera at home is great! His ISO is 0.283 and has a wOBA of 0.418. Cabrera hits lefties in a big way, with an ISO of 0.179 and has a wOBA of 0.354. Mike Napoli - 1B CLE Fanduel: 3200 Draftkings: 4400 - Napoli goes against Marcus Stroman at Progressive Field (Cleveland, Ohio). Stroman has an ERA against righties of 3.54 with a wOBA of 0.297. His ERA on the road is 4.52 and his wOBA is 0.321. During their history against eachother, Napoli has faced Marcus Stroman 9 times with a slugging percentage of 0.000. Napoli at home crushes it. He has an ISO of 0.322 and has a wOBA of 0.432. Napoli hits righties extremely hard. His ISO is 0.252 and has a wOBA of 0.352. This guy should get some good fantasy points. Paul Goldschmidt - 1B ARI Fanduel: 3900 Draftkings: 5100 - Goldschmidt will battle Luis Perdomo at Petco Park (San Diego, California). Perdomo has an ERA against righties of 6.34 with a wOBA of 0.390. Also he has not done well at home. His ERA at home is 7.99 and his wOBA is 0.416. Over the last week Goldschmidt has scored 16.1 Fanduel fantasy points while his season average is 13. He has a batting average of 0.348 and a slugging percentage of 0.522 over that time. Goldschmidt on the road is awesome and his ISO is 0.145 and has a wOBA of 0.379. Goldschmidt hits righties big time, to the tune of an ISO of 0.188 and has a wOBA of 0.374. Anthony Rizzo - 1B CHC Fanduel: 4800 Draftkings: 5400 - Rizzo is facing Jorge De La Rosa at Coors Field (Denver, Colorado) which ranks number 1 in runs scored and number 2 in home runs allowed. This game has a high over under of 11.5, so expect some runs to be scored. De La Rosa has an ERA against lefties of 5.72 with a wOBA of 0.341. He really isn't doing well at home. His ERA at home is 5.18 and his wOBA is 0.350. Rizzo on the road is money. His ISO is 0.291 and has a wOBA of 0.397. Rizzo hits lefties big time, to the tune of an ISO of 0.254 and has a wOBA of 0.377. Carlos Santana - 1B CLE Fanduel: 3600 Draftkings: 4300 - Santana will go against Marcus Stroman at Progressive Field (Cleveland, Ohio). Stroman has an ERA against switch hitters of 5.85 with a wOBA of 0.338. His ERA on the road is 4.52 and his wOBA is 0.321. Santana at home is incredible. His ISO is 0.227 and has a wOBA of 0.344. Santana hits righties big time, to the tune of an ISO of 0.274 and has a wOBA of 0.365. Ian Kinsler - 2B DET Fanduel: 3900 Draftkings: 4000 - Kinsler will face Henry Owens at Comerica Park (Detroit, Michigan). Owens has an ERA against righties of 5.59 with a wOBA of 0.434. In addition, he is really struggling on the road. His ERA on the road is 7.11 and his wOBA is 0.458. Kinsler at home is awesome and his ISO is 0.162 and has a wOBA of 0.346. Kinsler hits lefties big time, to the tune of an ISO of 0.221 and has a wOBA of 0.38. He should score some big points for you today if he is starting. Jose Altuve - 2B HOU Fanduel: 4000 Draftkings: 5400 - Altuve goes against Yovani Gallardo at Oriole Park at Camden Yards (Baltimore, Maryland). The over under on this game is huge, at 9.5, so get ready for a lot of runs. Gallardo has an ERA against righties of 4.37 with a wOBA of 0.352. His ERA at home is 3.66 and his wOBA is 0.351. During their history against eachother, Altuve has faced Yovani Gallardo 31 times with a slugging percentage of 0.290. Throughout the last 7 days Altuve has scored 15.3 Fanduel fantasy points while his season average is 14.3. He has a batting average of 0.370 and a slugging percentage of 0.630 over that time. Altuve on the road crushes it. He has an ISO of 0.223 and has a wOBA of 0.476. Altuve hits righties extremely hard. His ISO is 0.207 and has a wOBA of 0.409. He has a great matchup today. Jason Kipnis - 2B CLE Fanduel: 3500 Draftkings: 5100 - Kipnis will battle Marcus Stroman at Progressive Field (Cleveland, Ohio). Stroman has an ERA against lefties of 5.85 with a wOBA of 0.338. His ERA on the road is 4.52 and his wOBA is 0.321. Kipnis at home crushes it. He has an ISO of 0.224 and has a wOBA of 0.37. Kipnis hits righties very hard. His ISO is 0.214 and has a wOBA of 0.36. Jean Segura - 2B ARI Fanduel: 3600 Draftkings: 5300 - Segura will be seeing Luis Perdomo at Petco Park (San Diego, California). Perdomo has an ERA against righties of 6.34 with a wOBA of 0.390. at home. His ERA at home is 7.99 and his wOBA is 0.416. Over the last week Segura has scored 18.5 Fanduel fantasy points while his season average is 11.8. He has a batting average of 0.483 and a slugging percentage of 0.724 over that time. Segura on the road is incredible. His ISO is 0.146 and has a wOBA of 0.361. Segura hits righties big time, to the tune of an ISO of 0.156 and has a wOBA of 0.366. Coming off a 3 hit outting yesterday, Ben Zobrist - 2B CHC Fanduel: 4000 Draftkings: 4800 - Zobrist will be facing Jorge De La Rosa at Coors Field (Denver, Colorado) which ranks number 1 in runs scored and number 2 in home runs allowed. There's a high over under on this game, 11.5, so expect some runs to be scored. De La Rosa has an ERA against switch hitters of 5.59 with a wOBA of 0.371. Additionally, he isn't doing well at home. His ERA at home is 5.18 and his wOBA is 0.350. Zobrist on the road is incredible. His ISO is 0.204 and has a wOBA of 0.391. Zobrist hits lefties very hard. His ISO is 0.171 and has a wOBA of 0.366. Evan Longoria - 3B TAM Fanduel: 3700 Draftkings: 4800 - Longoria will be seeing Martin Perez at Tropicana Field (St. Petersburg, Florida). Perez has an ERA against righties of 4.83 with a wOBA of 0.340. Additionally, he isn't doing well on the road. His ERA on the road is 6 and his wOBA is 0.343. Throughout both of their careers, Longoria has faced Martin Perez 7 times with a slugging percentage of 1.143 with 1 homeruns. Through the last seven days, Longoria has scored 19.5 Fanduel fantasy points while his season average is 11.4. He has a batting average of 0.417 and a slugging percentage of 0.833 over that time. He also has hit 2 homeruns. Longoria at home0.245 and has a wOBA of 0.347. Longoria hits lefties big time, to the tune of an ISO of 0.216 and has a wOBA of 0.328. Look for a big game. Kris Bryant - 3B CHC Fanduel: 5300 Draftkings: 5600 - Bryant will be battling Jorge De La Rosa at Coors Field (Denver, Colorado) which ranks number 1 in runs scored and number 2 in home runs allowed. This game is showing a high Over under of 11.5,De La Rosa has an ERA against righties of 5.59 with a wOBA of 0.371. at home. His ERA at home is 5.18 and his wOBA is 0.350. Through the last seven days, Bryant has scored 23.8 Fanduel fantasy points while his season average is 13.9. He has a batting average of 0.517 and a slugging percentage of 0.931 over that time. He also has hit 3 homeruns. Bryant on the road is incredible. His ISO is 0.274 and has a wOBA of 0.424. Bryant hits lefties in a big way, with an ISO of 0.308 and has a wOBA of 0.431. He has a great matchup today. Jake Lamb - 3B ARI Fanduel: 3300 Draftkings: 4200 - Lamb will be battling Luis Perdomo at Petco Park (San Diego, California). Perdomo has an ERA against lefties of 7.11 with a wOBA of 0.372. Additionally, he isn't doing well at home. His ERA at home is 7.99 and his wOBA is 0.416. Lamb on the road is awesome and his ISO is 0.201 and has a wOBA of 0.33. Lamb hits righties in a big way, with an ISO of 0.302 and has a wOBA of 0.396. If you see him starting, try to roster him. Kyle Seager - 3B SEA Fanduel: 3500 Draftkings: 4900 - Seager is facing Matt Garza at Safeco Field (Seattle, Washington). Garza has an ERA against lefties of 5.81 with a wOBA of 0.378. He's playing poorly big time on the road. His ERA on the road is 5.4 and his wOBA is 0.349. Throughout the last 7 days Seager has scored 14.4 Fanduel fantasy points while his season average is 11.5. He has a batting average of 0.385 and a slugging percentage of 0.577 over that time. Seager at home is awesome and his ISO is 0.196 and has a wOBA of 0.364. Seager hits righties big time, to the tune of an ISO of 0.240 and has a wOBA of 0.4. Manny Machado - 3B BAL Fanduel: 4100 Draftkings: 4600 - Machado will be seeing Dallas Keuchel at Oriole Park at Camden Yards (Baltimore, Maryland). This could be a shoot out with an over under of 9.5, so expect some runs to be scored. Keuchel has an ERA against righties of 5.28 with a wOBA of 0.331. Also he has been playing poorly on the road. His ERA on the road is 5.74 and his wOBA is 0.354. During their history against eachother, Machado has faced Dallas Keuchel 12 times with a slugging percentage of 0.333. Machado has scored 12.6 Fanduel fantasy points while his season average is 12.4. He has a batting average of 0.280 and a slugging percentage of 0.600 over that time. He also has hit 2 homeruns. Machado at home is incredible. His ISO is 0.276 and has a wOBA of 0.399. Machado hits lefties extremely hard. His ISO is 0.200 and has a wOBA of 0.372. J.J. Hardy - SS BAL Fanduel: 2400 Draftkings: 3100 - Hardy will be facing Dallas Keuchel at Oriole Park at Camden Yards (Baltimore, Maryland). The over under on this game is huge, at 9.5, so expect a lot of runs to be scored. Keuchel has an ERA against righties of 5.28 with a wOBA of 0.331. Additionally, he isn't doing well on the road. His ERA on the road is 5.74 and his wOBA is 0.354. When they have faced eachother, Hardy has faced Dallas Keuchel 9 times with a slugging percentage of 0.444. Hardy has scored 10.9 Fanduel fantasy points while his season average is 8. He has a batting average of 0.273 and a slugging percentage of 0.591 over that time. He also has hit 2 homeruns. Jose Reyes - SS NYM Fanduel: 2700 Draftkings: 3300 - Reyes will go against Jeff Samardzija at AT&T Park (San Francisco, California). Samardzija has an ERA against switch hitters of 5.60 with a wOBA of 0.345. His ERA at home is 4.13 and his wOBA is 0.325. During the past week Reyes has scored 13.6 Fanduel fantasy points while his season average is 12. He has a batting average of 0.400 and a slugging percentage of 0.533 over that time. Reyes on the road0.156 and has a wOBA of 0.35. Francisco Lindor - SS CLE Fanduel: 3600 Draftkings: 4700 - Lindor will face Marcus Stroman at Progressive Field (Cleveland, Ohio). Stroman has an ERA against switch hitters of 5.85 with a wOBA of 0.338. His ERA on the road is 4.52 and his wOBA is 0.321. Lindor at home is money. His ISO is 0.167 and has a wOBA of 0.387. Lindor hits righties big time, to the tune of an ISO of 0.151 and has a wOBA of 0.353. Trea Turner - SS WAS Fanduel: 4000 Draftkings: 4700 - Turner will face Joel De La Cruz at Turner Field (Atlanta, Georgia). De La Cruz has an ERA against righties of 3.54 with a wOBA of 0.325. His ERA at home is 2 and his wOBA is 0.270. Turner on the road crushes it. He has an ISO of 0.205 and has a wOBA of 0.378. Turner hits righties in a big way, with an ISO of 0.279 and has a wOBA of 0.408. Jordy Mercer - SS PIT Fanduel: 2300 Draftkings: 3100 - Mercer will face Jose Urena at PNC Park (Pittsburgh, Pennsylvania). Urena has an ERA against righties of 4.13 with a wOBA of 0.325. Additionally, he isn't doing well on the road. His ERA on the road is 5.84 and his wOBA is 0.323. During the prior 7 days Mercer has scored 9.3 Fanduel fantasy points while his season average is 7.9. He has a batting average of 0.136 and a slugging percentage of 0.318 over that time. Mercer at home crushes it. He has an ISO of 0.108 and has a wOBA of 0.333. He should score some big points for you today if he is starting. Mike Zunino - C SEA Fanduel: 2900 Draftkings: 3100 - Zuninowill go against Matt Garza at Safeco Field (Seattle, Washington). Garza has an ERA against righties of 4.01 with a wOBA of 0.307. Also he isn't getting it done on the road. His ERA on the road is 5.4 and his wOBA is 0.349. Zunino at home0.647 and has a wOBA of 0.548. Zunino hits righties very hard. His ISO is 0.400 and has a wOBA of 0.436. He has a great matchup today. James McCann - C DET Fanduel: 2200 Draftkings: 2800 - McCann is facing Henry Owens at Comerica Park (Detroit, Michigan). Owens has an ERA against righties of 5.59 with a wOBA of 0.434. on the road. His ERA on the road is 7.11 and his wOBA is 0.458. McCann hits lefties extremely hard. His ISO is 0.308 and has a wOBA of 0.374. Evan Gattis - C HOU Fanduel: 3100 Draftkings: 4000 - Gattis faces Yovani Gallardo at Oriole Park at Camden Yards (Baltimore, Maryland). This game is showing a high Over under of 9.5, so get ready for a lot of runs. Gallardo has an ERA against righties of 4.37 with a wOBA of 0.352. His ERA at home is 3.66 and his wOBA is 0.351. Gattis has faced Yovani Gallardo 9 times with a slugging percentage of 0.778. 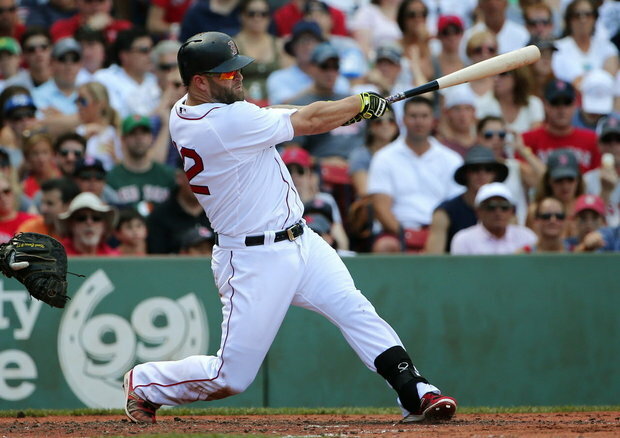 During the past week Gattis has scored 12.4 Fanduel fantasy points while his season average is 9.2. He has a batting average of 0.389 and a slugging percentage of 0.611 over that time. Gattis on the road crushes it. He has an ISO of 0.176 and has a wOBA of 0.338. Jason Castro - C HOU Fanduel: 2500 Draftkings: 3600 - Castro faces Yovani Gallardo at Oriole Park at Camden Yards (Baltimore, Maryland). This game has a high over under of 9.5, so I think you should expect a lot of fantasy points being scored. Gallardo has an ERA against lefties of 6.16 with a wOBA of 0.353. His ERA at home is 3.66 and his wOBA is 0.351. Through the times they faced eachother, Castro has faced Yovani Gallardo 21 times with a slugging percentage of 0.619 with 1 homeruns. During the last week of games, Castro has scored 17 Fanduel fantasy points while his season average is 7.6. He has a batting average of 0.235 and a slugging percentage of 0.824 over that time. He also has hit 3 homeruns. Castro on the road is incredible. His ISO is 0.178 and has a wOBA of 0.336. Castro hits righties very hard. His ISO is 0.202 and has a wOBA of 0.337. Tucker Barnhart - C CIN Fanduel: 2500 Draftkings: 3400 - Barnhart is facing Julio Urias at Great American Ball Park (Cincinnati, Ohio). Urias has an ERA against switch hitters of 4.58 with a wOBA of 0.356. In addition, he is really struggling on the road. His ERA on the road is 5.54 and his wOBA is 0.363. During the last week of games, Barnhart has scored 13.4 Fanduel fantasy points while his season average is 7.3. He has a batting average of 0.231 and a slugging percentage of 0.538 over that time. Barnhart at home0.220 and has a wOBA of 0.363. J.D. Martinez - OF DET Fanduel: 3600 Draftkings: 4900 - Martinez will face Henry Owens at Comerica Park (Detroit, Michigan). Owens has an ERA against righties of 5.59 with a wOBA of 0.434. He really isn't doing well on the road. His ERA on the road is 7.11 and his wOBA is 0.458. Over the last 7 days Martinez has scored 18.6 Fanduel fantasy points while his season average is 12. He has a batting average of 0.519 and a slugging percentage of 1.037 over that time. He also has hit 4 homeruns. Martinez at home is incredible. His ISO is 0.307 and has a wOBA of 0.456. Martinez hits lefties big time, to the tune of an ISO of 0.274 and has a wOBA of 0.405. Justin Upton - OF DET Fanduel: 2600 Draftkings: 2700 - Upton is facing Henry Owens at Comerica Park (Detroit, Michigan). Owens has an ERA against righties of 5.59 with a wOBA of 0.434. Also he has not done well on the road. His ERA on the road is 7.11 and his wOBA is 0.458. Coming off a 3 hit outting yesterday, George Springer - OF HOU Fanduel: 3800 Draftkings: 5000 - Springer will be taking on Yovani Gallardo at Oriole Park at Camden Yards (Baltimore, Maryland). This could be a shoot out with an over under of 9.5, so get ready for a lot of runs. Gallardo has an ERA against righties of 4.37 with a wOBA of 0.352. His ERA at home is 3.66 and his wOBA is 0.351. During the past week Springer has scored 18.6 Fanduel fantasy points while his season average is 12.4. He has a batting average of 0.391 and a slugging percentage of 0.739 over that time. He also has hit 2 homeruns. Springer on the road is incredible. His ISO is 0.236 and has a wOBA of 0.371. Springer hits righties extremely hard. His ISO is 0.181 and has a wOBA of 0.341. David Dahl - OF COL Fanduel: 3700 Draftkings: 4800 - Dahl will be pitted against Jason Hammel at Coors Field (Denver, Colorado) which ranks number 1 in runs scored and number 2 in home runs allowed. The over under on this game is huge, at 11.5,Hammel has an ERA against lefties of 3.98 with a wOBA of 0.322. His ERA on the road is 3.8 and his wOBA is 0.320. During the past week Dahl has scored 14.1 Fanduel fantasy points while his season average is 13. He has a batting average of 0.316 and a slugging percentage of 0.579 over that time. Dahl at home is awesome and his ISO is 0.250 and has a wOBA of 0.429. Dahl hits righties extremely hard. His ISO is 0.284 and has a wOBA of 0.415. This guy should get some good fantasy points. Gregory Polanco - OF PIT Fanduel: 3400 Draftkings: 4500 - Polanco is facing Jose Urena at PNC Park (Pittsburgh, Pennsylvania). Urena has an ERA against lefties of 10.31 with a wOBA of 0.380. He's playing poorly big time on the road. His ERA on the road is 5.84 and his wOBA is 0.323. Polanco at home is awesome and his ISO is 0.201 and has a wOBA of 0.363. Polanco hits righties big time, to the tune of an ISO of 0.207 and has a wOBA of 0.348. Really try to get him into your lineups. Adam Duvall - OF CIN Fanduel: 3200 Draftkings: 3800 - Duvall will be facing Julio Urias at Great American Ball Park (Cincinnati, Ohio). Urias has an ERA against righties of 4.58 with a wOBA of 0.356. In addition he really has been pretty weak on the road. His ERA on the road is 5.54 and his wOBA is 0.363. Through the last seven days, Duvall has scored 11.8 Fanduel fantasy points while his season average is 11.2. He has a batting average of 0.154 and a slugging percentage of 0.385 over that time. Duvall at home is great! His ISO is 0.291 and has a wOBA of 0.345. Duvall hits lefties extremely hard. His ISO is 0.247 and has a wOBA of 0.34. Mark Trumbo - OF BAL Fanduel: 3700 Draftkings: 4400 - Trumbo will face Dallas Keuchel at Oriole Park at Camden Yards (Baltimore, Maryland). There over under on this game is pretty big at 9.5, so I think you should expect a lot of fantasy points being scored. Keuchel has an ERA against righties of 5.28 with a wOBA of 0.331. Also he has not done well on the road. His ERA on the road is 5.74 and his wOBA is 0.354. During his career, Trumbo has faced Dallas Keuchel 13 times with a slugging percentage of 1.538 with 3 homeruns. Throughout the last 7 days Trumbo has scored 13.6 Fanduel fantasy points while his season average is 11.6. He has a batting average of 0.143 and a slugging percentage of 0.571 over that time. He also has hit 3 homeruns. Trumbo at home is awesome and his ISO is 0.288 and has a wOBA of 0.369. He should score some big points for you today if he is starting.